Thursday, May 15, 2008 at 8:00 p.m.
Hallwalls Artist-in-Residence Project (HARP) and /The Imaginary Line/ co-presented by Hallwalls, the Buffalo Arts Studio and El Museo. 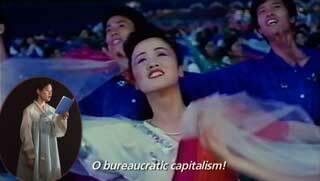 (62min., 2008) As part of his residency, HARP media artist Jim Finn continues his investigations of cinema, art, and propaganda, this time turning his attention to this North Korean ideology. In the late 1960's Kim Jong II guaranteed his succession as the Dear Leader of North Korea by adapting his father's Juche (pronounced choo-CHAY) philosophy to propaganda, film and art. Translated as self-reliance, Juche is a hybrid of Confucian and authoritarian Stalinist pseudo-socialism. The film is about a South Korean video artist who comes to a North Korean art residency to help bring Juche cinema into the 21st century. Inspired by the real-life story of the South Korean director kidnapped in the 70's to invigorate the North Korean film industry, the film follows Yoon Jung Lee, a young video artist invited to work at a Juche art residency [!!!] on a North Korean collective farm. The story is told through the films she made at the residency as well as interviews with a Bulgarian filmmaker and even a brief sci-fi movie. The film, which premiered at the Ann Arbor Film Festival, was the official closing film of the final New York Underground Film Festival. This screening is in conjunction with /The Imaginary Line/. "Jim Finn has made a name for himself...thanks to his feeling for irony and his capacity to shape something new from propaganda, news and other historic images. Not to forget his very dry sense of humour." Jim Finn (b. St. Louis, 1968) is an artist whose films and videos use humor and historical fiction to examine communist ideology, capitalism and revolutionary art practices. His work has screened at festivals, museums, and cinematheques such as Rotterdam International, New York Underground, Edinburgh International, Museo Reina Sofia in Madrid, and the Harvard Film Archive. His latest work is a series of feature-length films looking at Marxist ideology. The first of these, Interkosmos, was called "a retro gust of communist utopianism" by the Village Voice and "charming and fantastic, so full of rare atmospheres" by Canadian filmmaker Guy Maddin. Variety called his follow-up film La Trinchera Luminosa del Presidente Gonzalo "pure filmmaking legerdemain" and called the performances "astonishing."